The Marq Lighting Gesture Spot 100 is an Ultra-Light design, and projects a crisp, tight beam for precise aerial effects and also offers a manual focus for crisp clean gobos. This guide answers some frequently asked questions about the Marq Lighting Gesture Spot 100. What does the Marq Lighting Gesture beam 100 come with? 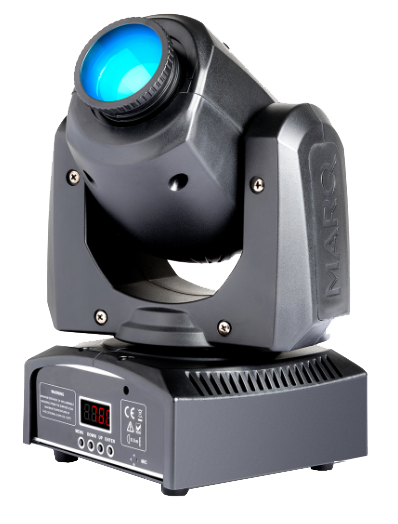 Does the Marq Lighting Gesture spot 100 have DMX capability? What is the Powerlink Feature? What does each DMX channel do? Does this have a Slave Mode? How do I setup the Marq Lighting Gesture spot 100 with a DMX controller? Does the Marq Lighting Gesture spot 100 have a sound active mode? How do I set the Sound-Active sensitivity? Why does the LED not get brighter when I move the dimmer to a larger value? My Gesture Spot 100 appears to be malfunctioning 30 feet in the air. What do I do? Where can I find more information about DMX, controllers, and lighting software? The Gesture Spot 100, is a lightweight fixture measuring in it only 5.6lbs (2.55kg). Yes, it does! The Gesture Spot 100 has the traditional DMX IN and DMX OUT jacks built in. This will allow you to use these lights with a qualified DMX controller, and with the proper DMX Cables. The Powerlink feature lets you link up to 18 Gesture Spot 100s together with power cables (IEC cables). One reason to do this may be if you have a shortage of wall outlets or power supplies to plug multiple units into. You can then power all of them when having just one Marq Lighting Gesture Beam 100 connected to a wall outlet. Insert the included power cable into the wall and then the other end into the Marq Lighting Gesture Spot 100. On the opposite power plug on the Marq Lighting Gesture Spot 100, you will see a power jack that works the opposite way. On this jack plug the opposite end of an IEC cable here. Now plug the other end of the power cable into the power jack of another Marq Lighting Gesture Beam 500. This will supply power to the Marq Lighting Gesture Spot 100.? There are 2 options for setting the controller up for the desired amount of channels you are going to use, either 7 channel or 11 channel. See below for what each of those channels will do. Shutter - Lets you set the shutter for open, closed, Strobe, Etc. DMX is a lighting control protocol which allows users to have ultimate control over their lighting needs. DMX protocol allows the opportunity to raise the bar and tailor the lighting experience to the environment. It lets the technician be flexible and create dynamic lighting sequences that will impress all that are watching. The Gesture Spot 100 does have a Slave mode. Press the Menu button to access the internal options. Use the Down button to highlight the Auto Movement selection, and push Enter. Use the Down button to highlight SLAv, and push Enter. You can now use the Up or Down buttons to select 1-4 this option, and press Enter to choose your selection. Connect a DMX cable from the DMXoutput on the DMX controller that you are using, and attach it to the DMX input on the Gesture Spot 100. Below is a picture showing this. Each fixture in this chain will receive all DMX data. Depending on how many lights are inside your universe will depend on how many lights may be used. For setting the Sound-Active mode, follow the steps below. Use the Down button to highlight Soun, and push Enter. You can now use the Up or Down buttons to turn this option On or Off, and press Enter to choose your selection. For setting the Sound-Active mode sensitivity, follow the steps below. Use the Down button to highlight SEnS, and push Enter. Even though there is no mechanical shutter (all Gesture series products have electronic shutters), the shutter value must be moved to open on channel 7. The shutter values to allow the dimmer to function are either 4 - 7 or 216 - 255. It is possible to reset the Gesture Spot 100 from the DMX controller (only if in 11 channel mode). On channel 11, send the Reset All DMX value between 200 - 209, for more than 2 seconds to reset the entire fixture. This is a soft reset that restores the Gesture Spot 100 to the power on state.